The Amphitheatre has been described by internationally recognised singers and musicians as the best outdoor venue in New Zealand. Renowned for its acoustics, sight-lines and atmosphere it is a truly memorable location. Rather than simply being an uncomfortable slope on a hill, the Black Barn Amphitheatre was carved out of the hillside and purpose-built from scratch. Large flat grassed terraces mean concert-goers sit in comfort with close uninterrupted views of the stage and the whole of Hawkes Bay as their backdrop. Every terrace is fairy lit for concerts and the entire amphitheatre is surrounded by a circle of 50 year-old muscatel grapes. 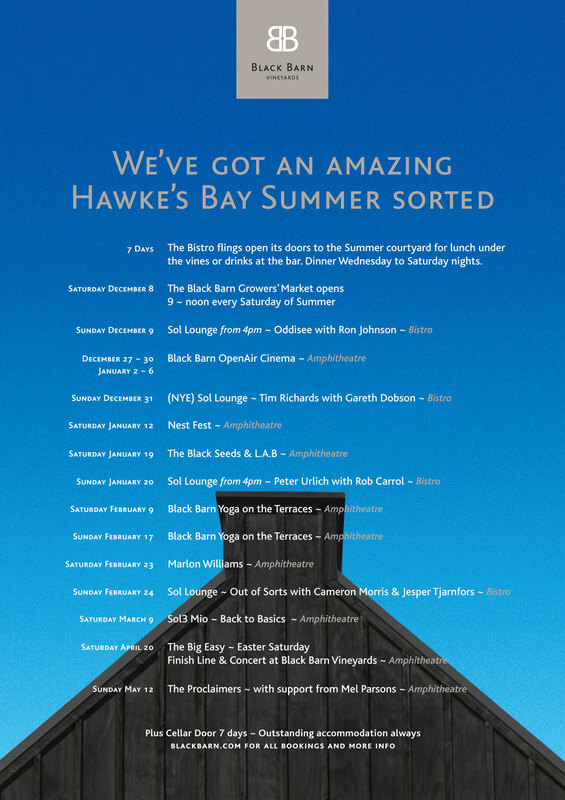 The Black Barn Summer Concert season is restricted to a limited number of events over Summer and bookings can be made via the Cellar Door and website.